You may remember Tsuma, my friend from Gona that gave me a chicken in appreciation of me working with him. He has been extra busy the last couple of months and is the best entrepreneur in the area. The honey business has done so well that he has increased his number of hives to 32. Some of them are the yellow boxes that you see and some of them are hollow logs with caps put in the end. He lost one of his hives to a colony of ants that built a cancerous looking nest on the bottom. I guess in the world of insects, ants win over bees. Ants came in and built their nest on the bottom of this beehive. Tsuma has led his group to amazing success. They have been very busy in their vegetable gardens and fields and have a great crop of kale, tomatoes, spinach, okra, and several other vegetables. Their corn is looking much better than any around the area. They have also learned from Rabecca that they can dry their kale and store it for later. They have plenty of vegetables for their own families. They have been able to sell large quantities and use the money for improving their community garden, paying school fees for their children, and setting up a group bank account. They also discovered that if they dry their kale and save it for a couple of months when the dry season comes, they can sell it for twice the price. 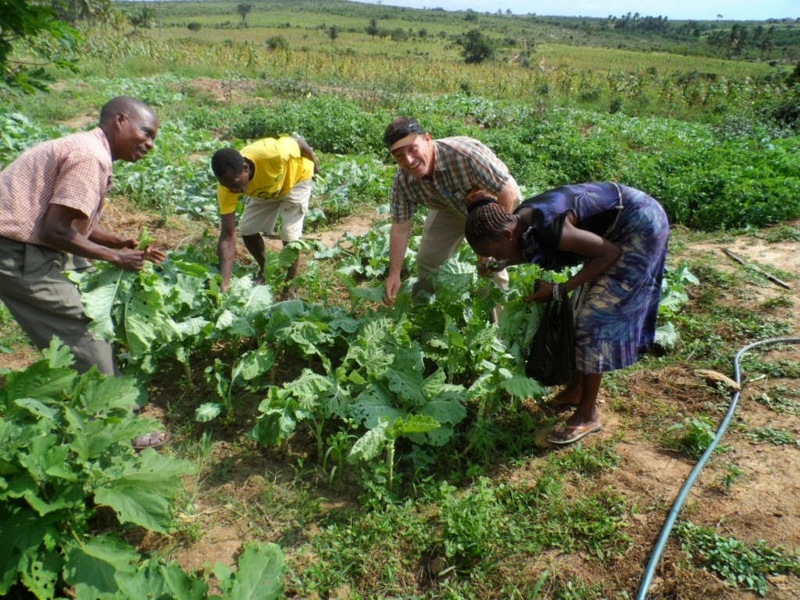 Tsuma's next big project is to learn how to do drip irrigation so that they can be even more efficient with their water. They have also started growing fruit trees to add to their food supply. With the teaching, coaching and encouragement of Feed The World and Tsuma's leadership, this village is hurling itself out of poverty and dependence. They are setting a great example for their neighboring villages and making a new life for their children. Congratulations to Tsuma and the Gona Village Group!